Get the perfect monoclonal antibody by phage display! Accelerate your development program with ProteoGenix' antibody phage display services and get your purified recombinant antibodies in less than 2 months! Our libraries are made of various monoclonal antibody formats including Fab, scFv or VHH and species! Thanks to our high diversity human libraries, humanization is not necessary for your therapeutic antibody development and you benefit from our strong guarantees! We guarantee AT LEAST 3 unique binders against your antigen! You get the full ownership of the antibody sequence generated! Our premium libraries contain at least 109 different variants! The variety of our libraries allows us to propose a wide range of formats to fit a wide range of applications. Mouse, sheep, lama, rabbit monoclonal antibodies… Besides our naïve libraries, you can also choose to develop immune libraries from a species of your choice without limitation. From antigen to antibody in less than 7 weeks! Naïve library screening does not require any animal use. Buy our naïve libraries or your own immune libraries! Naïve or immune antibody phage display libraries? Interested in our naïve library screening service or in constructing an immune library ? Please feel free to contact our dedicated account manager. One of our customers requested a human antibody against a small molecule. The small molecule was conjugated to different carriers to achieve optimal coating. Biopanning was performed using our human naïve library of high diversity. A total of 192 single phage binders were screened and validated by ELISA. 10 antibody sequences were required. There is an obvious enrichment in anti-antigen binders even if it is difficult to remove the binders to carriers (known phenomenon). Although there are many unspecific binders (known phenomenon), an obvious enrichment in anti-antigen binders is observed (data in bold). We generated 11 unique clones that specifically and strongly bind to the small molecule antigen. Our customer decided to express these 11 clones as recombinant antibodies and to order the screening of 192 additional single phages, which resulted in the identification of 7 new unique sequences. 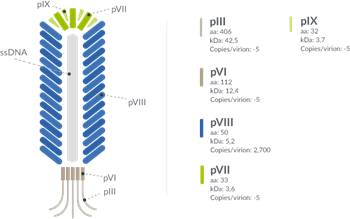 Learn more about our capabilities of antibody phage display services. Discover our complete report by clicking on the “GET A PDF REPORT” button. 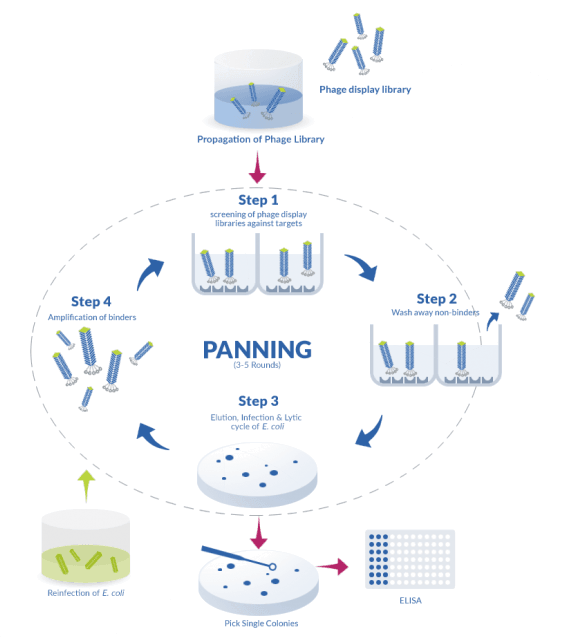 What is antibody phage display? The phage display technology involves the determination of interaction partners of a protein (protein-protein, protein-DNA or protein-peptide interactions), which would be used as the “bait” for phages expressing peptides, proteins or antibodies coded by a huge DNA library (consisting of all coding sequences of a given organism). The function of that protein may therefore be determined. The phage display technique uses the filamentous phage, a virus that lives on E. coli. This method has proven to be a powerful technique for the interrogation of libraries containing billions of different proteins or peptides. The application of phage display on large antibody libraries has been a real success with regard to the isolation of monoclonal antibodies which are highly specific against an antigen. These new methods using libraries composed of billions of antibodies expressed on phages offer highly valuable alternatives that have proven to be as effective as traditional methods in the generation of billions of components and their quick selection to identify the most interesting candidates for your research. As such, phage display is a useful and state-of-the-art tool widely used in therapeutic antibody discovery. The major advantage of phage display lies in the simplified structure, stability and therefore reliability of phages, making it possible to be applied to various surfaces but also to in vivo applications. The main characteristic of phage display technique is the physical coupling between genotype and phenotype (phage will « display » the protein on its outside while containing the gene for the protein inside). This requires the artificial introduction of encoding DNAs into phages, explaining the large diversity of phage-based antibody libraries. The engineered antibody fragments which are generated by phage display at ProteoGenix are single chain variable fragment format (scFv), Fab-based antibody format presentation and single-domain antibodies (VHH). All ProteoGenix’ antibody phage display libraries are made of the M13 filamentous phage, a virus that infects the bacterium E. coli. This bacteriophage is the most commonly used for phage display and will be appropriate for you research. M13 is a lysogenic filamentous phage, comprised of a circular and single-stranded DNA encased in a thin flexible tube made up of about 2700 copies of a single protein called pVIII, the major coat protein, and about 5 copies of pIII, the minor coat protein, present at the ends of the tube. Infection with M13 plasmids is not lethal for bacteria and they are used for many recombinant DNA processes.